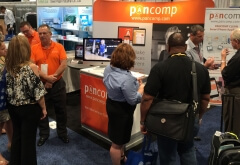 Trade shows for 2016 successfully behind us – Pancomp would like to thank everyone who visited our booths! Another hectic week behind us in the USA – Yet another training completed and a new company set up to use Pancomp solutions in their business, as well as the biggest trade show of the year done and dusted. This year we had a couple of big shows to attend, most recently the ISSA Interclean Chicago show which was a great success. The show was very busy and we had lots of traffic at our booth. As usual, the attendees at ISSA shows are very knowledgeable about the solutions on the market. The feedback received on Pancomp solutions was very encouraging and it seems our solutions maintains a competitive advantage over other systems with real time and advanced features. One interesting feature added for the needs of US customers is the inventory management feature on the Pancomp software. Pancomp also attended the ISSA Interclean in Amsterdam earlier this year. Similarly to Chicago we had a great show with many new business relationships taken forward. In Amsterdam we were able to introduce some of the new features to Pancomp Smart Phone App. Other shows we attended this year included a miniClean show in Jyväskylä Finland in September and a security show ASIS NYC Security Conference and Expo in New York, USA in April. Both were new shows to us, but definitely well worth it to get to know some new people in the cleaning and security industries. We have met a lot of great people over the year and we look forward to creating lasting business relationships, as well as meeting new people. Thank you for attending the shows and visiting our booths! Looking forward to 2017 and Finnclean in Tampere, Finland, ISSA show in Las Vegas, and other shows over the year!